As a Catholic, I grew up with a sense of certain saints’ lives. Although there are thousands of saints who have died for the religion, there are definitely celebrity saints that were more known by the general Catholic public. These celebrity saints had spectacular deaths (like St. Sebastian), wrote important works (like St. Augustine), or were integral to founding of the religion’s dominance in an ancient country (like St. Patrick). Then there were saints that the religion teacher favored and you had to learn about them although you didn’t quite understand why. This is where Thomas Becket landed for me. My sophomore year in high school, I had a lay religion teacher (lay meaning he was not a priest or a monk like most religion teachers are) who was fascinated by Thomas Becket and a couple other odd saints. We learned about him in great detail and was quizzed about the facts of his life. But he didn’t seem to do much other than have the position of archbishop given to him out of convenance and then take advantage of the appointment to oppose a petulant king (aren’t they all?). When there are saints that fought lions and had visions and stigmata, it seems paltry by comparison. And then he turned on this movie for us to watch in class. I finally understood why he liked Thomas Becket. It wasn’t because of the influence he had over the religion at the time or gestures he made towards his people. It was instead that he liked this movie and wanted an excuse to show it. So as a teenager I had to suffer through this film while my classmates all fell asleep around me. (I have a problem falling asleep in areas that are not my couch or my bed) Ironically this was the year I started having serious doubts about my religion. Thomas Becket sits in an enviable position. In the twelfth century, he has the year of one of the most influential people currently living. King Henry II rules over an English country dominated by a rift between two ethnic groups, the Saxons and the Normans. The Saxons conquered land previously owned by the Normans and forced upon them their king, King Henry II. Although he is a Norman, Becket becomes the confidant of King Henry II. King Henry elevates him through the noble ranks at a speed that is uncommon during his generation. He is made chancellor and then archbishop once these spots fall vacant. This is all done so that King Henry II can have influence over the Catholic church’s massive political weight. But Once Becket becomes archbishop, he realizes his love is for God and not the king and defies him on a few key issues. Taking a radical stance does nothing for King Henry II, so in a powerful scene the king denounces Becket and cries over his new enemy. The king issues an ultimatum. Either Becket comes back groveling and denouncing his rebellion or he issues a prize for his head. Becket refuses to do the first thing, so the second thing happens. In a dramatic scene, Becket is ambushed by soldiers looking to make a few bucks while he is performing mass. For me this movie is in the same camp as Zeffirelli’s Romeo and Juliet A Man for All Seasons or Ben-Hur. These heavy period piece movies get bogged down in creating period atmosphere and forget to tell a compelling story. Oh and they are almost always shown in classrooms to illustrate historical events or just to give the teacher’s a day off. This film is stuck in the world building portion of the movie. There is no compelling reason for me to be rooting for Becket at any point. In fact I think that Becket isn’t even a compelling character. He is a bland goody-too-shoes that emits no emotion and acts oddly saintly while he is still living. 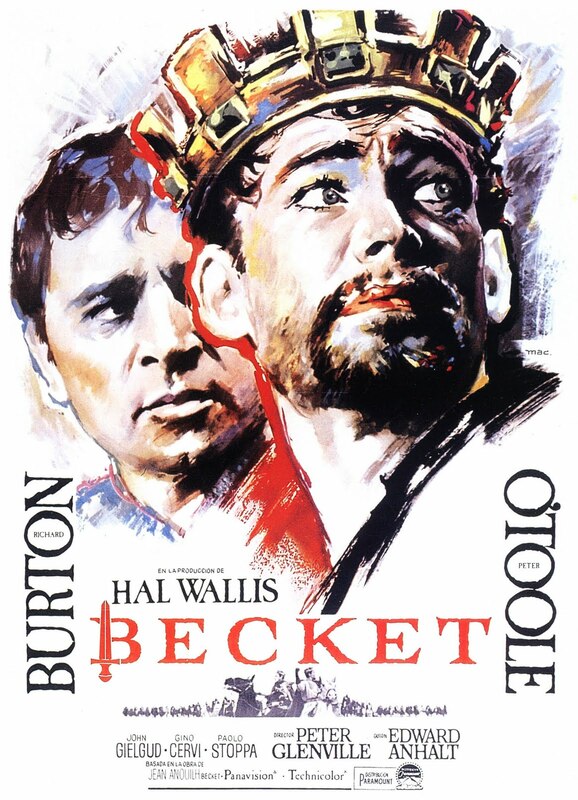 King Henry II is the interesting character of the movie because he has an obvious affection for Becket that supersedes just platonic friendship. He loves Becket but this isn’t explored (because homosexuality was still illegal in England in the sixties, so they could do nothing but hint at it.) King Henry II is also played by Peter O’Toole, one of the most interesting actors ever to grace the screen while Thomas Becket is portrayed by Richard Burton who could be great but does not shine in understated roles. When they share the screen together, Burton is dominated by O’Toole in almost every way. Despite it being Becket’s story, King Henry II becomes the star of the picture. The moral of this post is please teachers make sure that the movie you are showing in class really adds something to the discussion instead of forcing the addition. Your students will hate you for it and possibly doubt their chosen religion because of you. Do you really want that on your hands?